A portable toilet with a woman inside was accidentally carried across a festival site by a forklift truck. 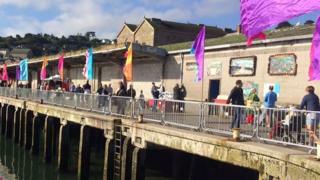 The woman had gone to use the toilet ahead of the opening of the Newlyn Fish Festival in Cornwall. Harbour master Rob Parsons said she must have "thought she had teleported" when she came out of the toilet in a new location. The woman was not injured in the incident on Monday, organisers confirmed. Mr Parsons told BBC Radio Cornwall: "She got in the loo and then it was picked up and taken to the other side of the harbour with her in it. Mark Kempthorne, director of toilet provider Andyloos, said it was not the first time a forklift driver had picked up a toilet with somebody inside, although on this occasion it had not been done by a member of his staff. He said it was an easy mistake to make as drivers "go in through the back entrance" to pick up the toilet. He said: "It does happen quite a bit to be honest - I've done it a few times."